November 26, 2016 by admin·Comments Off on Time for a change…. As you many know, I have been battling to overcome two major diseases, AML Lukemia, and Parkinsons Disease, over the past two years. With the help of my doctors, my condition looks to be pretty good. The doctors are giving me a good long term prognosis. Thank you doctors! I am overjoyed by the results of their life saving efforts. The treatments they have used on me while saving my life have presented some other major obstacles to deal with however. Those treatments have taken a dramatic toll on me by greatly reducing my physical strength, agility, and flexibility. My new limitations are restricting me most days from providing what I feel I need to do to teach my aikido students well. Coming to that realization was not an easy one for me but it is reality. I have decided to step down as Chief Instructor of Ki Rei Shinkan Aikido. 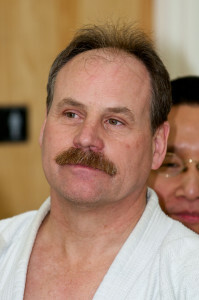 Sensei Mike Wood has accepted the role and responsibility of chief instructor and dojo-cho. He is an excellent instructor as you well know. He will be a wonderful leader of the community that all our members have helped to build over the years. He has already made major contributions as a former member of the dojo teaching staff. I will not be disappearing! I will be coming to teach classes and to participate when my health permits. I will also be supporting the efforts of the growth of the dojo even if I am not routinely on the mat. I will also continue to manage the business requirements (eg. collecting dues, paying bills, taxes, etc) of running our dojo. Just like I have in the past, I want to ensure that our students have a vibrant dojo in which they can learn Aikido. Our dojo community/family mean the world to me! Aikido means the world to me! I want to thank you for giving me your past support. So many of you helped me through some very tough times. I ask you to support Sensei Mike with equal fervor. Thank you in advance as I am sure you will all continue to practice hard to strengthening your technique and understanding of Aikido. And in doing so, improve our dojo and our world. I am happy to accept the role of Chief Instructor . While I would prefer to have Sensei Dore able to continue as Chief Instructor, I will do my best to step in and support the dojo and the students and will do my best to insure the integrity and quality of teaching that we have enjoyed under Sensei Dore here at ki rei shinkan. We will look forward to have Sensei join us often and to take his place again as chief instructor when he has recovered his strength and mobility, which I have no doubt he will accomplish in due time. Till then I will do my best. I have no intention of making any major changes, we will continue to embrace ‘Tenshinkan” (AAA) Aikido and continue to produce quality practitioners and embrace an Aikido practice which is both martial and humane. I look forward to your support. No classes 11/21, Happy Thanksgiving! November 22, 2016 by admin·Comments Off on No classes 11/21, Happy Thanksgiving!